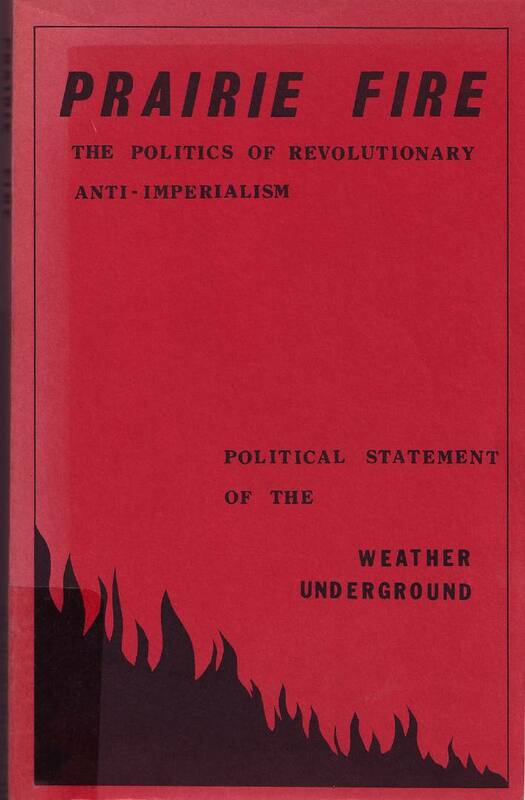 The quotes above were scanned directly from a now long-forgotten book entitled Prairie Fire: The Politics of Revolutionary Anti-Imperialism, which was written and published in 1974 by William Ayers, Bernardine Dohrn and other members of the Weather Underground. In this slim volume, which functioned as the Weather Underground's ideological manifesto, Ayers declares himself to be a communist, and announces that his group's bombing campaign was intended to start a violent revolution to overthrow the American government. After a long search, I was lucky enough to finally get my hands on a copy of the original edition of Prairie Fire, which is now extremely rare and hard to find. It was written in secret while Ayers and his fellow Weather Underground members were still in hiding and on the run, and still actively engaging in bombings and other violent acts. This essay features many high-resolution scans of quotes and entire pages taken directly from Prairie Fire, which journalists, bloggers and other media members are free to copy and re-post. If you're interested only in viewing or downloading the scans taken from Prairie Fire, scroll down this page to see a large selection of shocking quotations which you can use as you see fit. My introductory explanation below simply provides context and elucidates why the text of Prairie Fire is so significant at this very moment in history. 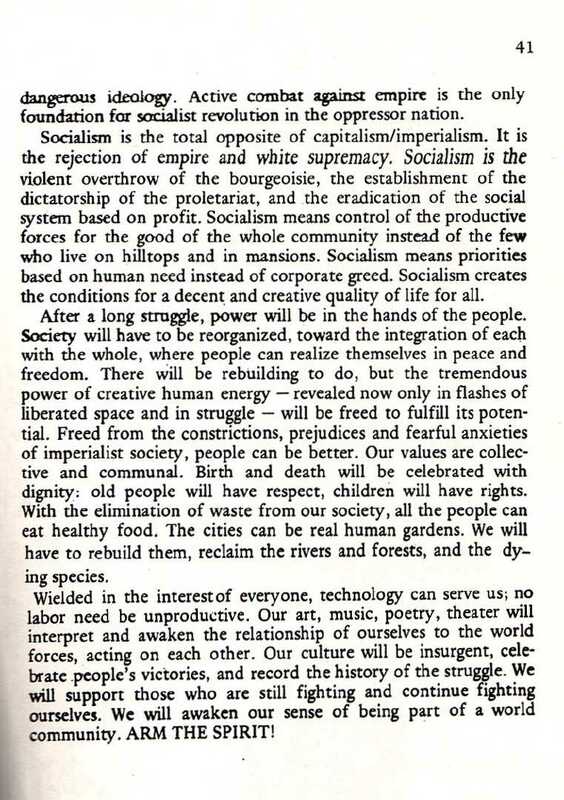 So far in 2008, there has been almost no mention of this manifesto and its insurrectionary goals. It seems as if the media, William Ayers, Barack Obama and his supporters don't want you to know about Prairie Fire. Which is exactly why you need to see it. How Is This Relevant to the 2008 Presidential Campaign? There's nothing illegal about being a communist. People in this country are free to hold whatever political beliefs they so choose. I don't know William Ayers, I've never met him (that I'm aware of), and I have nothing against him personally. This essay only exists to correct and unequivocably debunk claims routinely made by the mainstream media over the last few weeks about William Ayers, his beliefs, and the purpose behind his bombing campaign during the 1970s. Specifically, when questions arose during the 2008 presidential race about Barack Obama's past associations with William Ayers, many media reports and articles blandly described Ayers as a "Vietnam-era radical" and the Weather Underground as a group that set bombs "to protest against the Vietnam War." Both of these characterizations are demonstrably inaccurate. How do we know that William Ayers himself co-authored Prairie Fire? Doesn't the cover say it's by The Weather Underground as a group, and doesn't mention him specifically? But that's not all. On his own blog, in his own resumé, Ayers lists himself as the author of Prairie Fire. Which is as conclusive as you can get. The rest of this essay consists primarily of scanned pages taken directly from an actual physical copy of Prairie Fire printed in 1974. As you will notice, the production quality was fairly crude, with some pages being typewritten (possibly by William Ayers or Bernardine Dohrn themselves) with others typeset in varying fonts, and then printed somewhat inconsistently with different densities in different sections of the book. While this may have lent Prairie Fire an air of outlaw authenticity when it first was distributed, it looks rather odd and irregular in the era of computers and modern typography. I only mention this detail here to explain why the various scanned pages and quotes seen below look different from each other. PLEASE NOTE: For each of the full-size scanned pages displayed below, if you click on the image, your browser will open a new window showing a high-resolution version of the scan. I provide the hi-res scans as proof that this evidence is real, and in case anyone wants to inspect the text in more detail. The individual quoted lines scanned below are already high-resolution, so there is no need to click on them. In a few instances, the quoted sentences start or end in the middle of a line; in those cases, I only display the relevant quote in question; I do not include the text on the remaining portions of the lines. Underneath each scanned image is a transcription of some (or all) of the text shown, to make things easier for bloggers and journalists to copy and paste the sections which interest them. 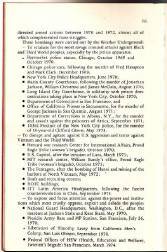 Below the scanned images is a final section providing quotes, links, videos and documentation proving that William Ayers maintained his political beliefs essentially unchanged throughout the '80s, '90s and 2000s, during which time he was accepted into the upper echelons of Chicago society, mingling and working with academics, activists and politicians -- including Barack Obama. 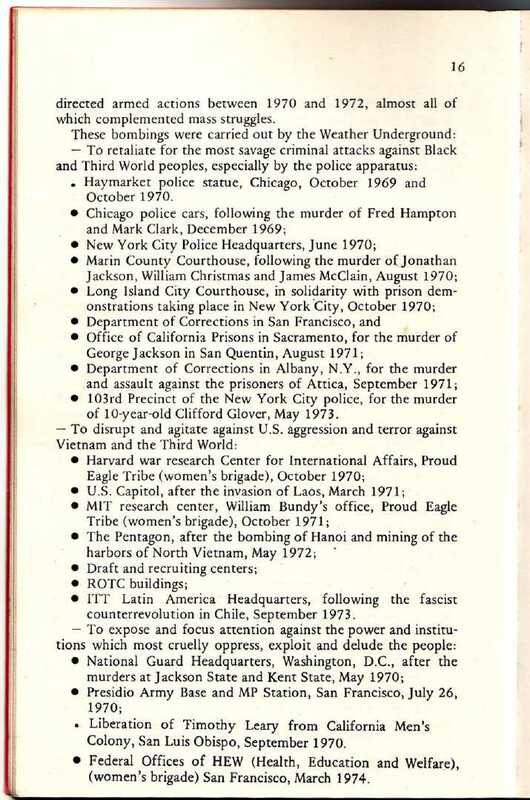 On page 16 of Prairie Fire, Ayers and his fellow co-authors brag about their numerous acts of domestic terrorism, and provide a handy list detailing not only each crime but in most cases the justification for each crime as well. 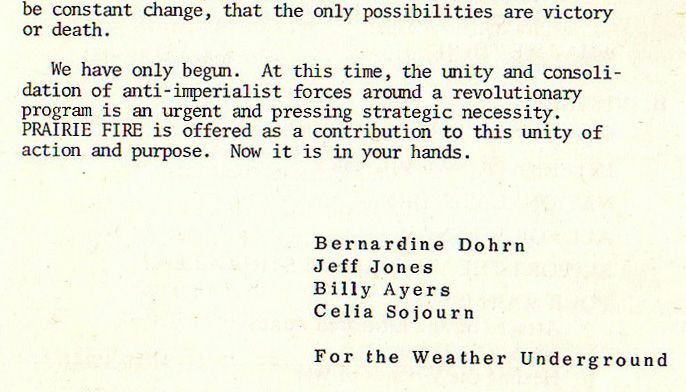 Note an important detail: Most of the stated rationales for the Weather Underground's violent acts have nothing whatsoever to do with Vietnam. 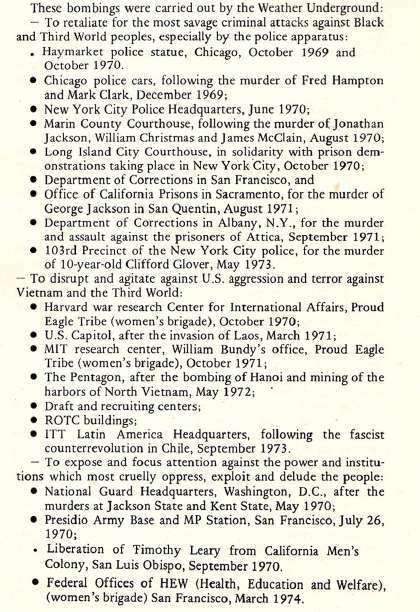 This disproves the ubiquitous media assertion that Ayers and the Weather Underground were "Vietnam War protesters." Also note Wikipedia's list of Weather Underground actions that provides additional details regarding their putative justifications, including bombing a bank "in solidarity with striking Puerto Rican cement workers" and bombing a federal office building due to "the need for women to take control of daycare, healthcare, birth control and other aspects of women's daily lives," among many others which make no mention of Vietnam. 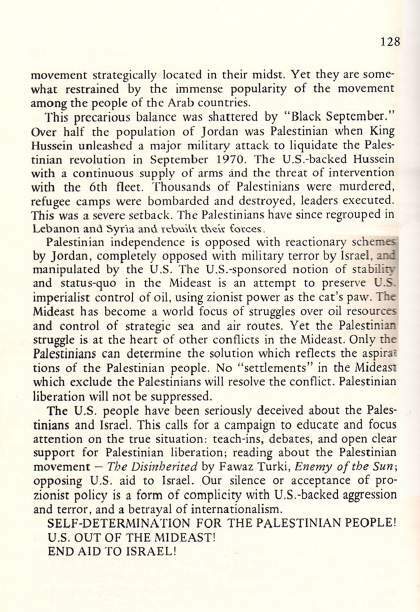 Also note that the bombings and other violent acts continued after Prairie Fire was published, and that all the Weather Underground "actions" in 1974 and '75 happened after the United States had already pulled its ground troops out of Vietnam and was no longer an active combatant in the ground war, which would have rendered any Vietnam War protests pretty much meaningless. The main body of Prairie Fire begins on page 10, after various introductory pages. The following four scanned images are all short quotes taken from page 10. Below each quote is a transcription of the text. The final image of this section shows all these quotes in context in the book on page 10 itself. We are a guerrilla organization. We are communist women and men, underground in the United States for more than four years. Revolutionary war will be complicated and protracted. It includes mass struggle and clandestine struggle, peaceful and violent, political and economic, cultural and military, where all forms are developed in harmony with the armed struggle. Without mass struggle there can be no revolution. Without armed struggle there can be no victory. The following scan shows the full two-page spread of pages 10 and 11. 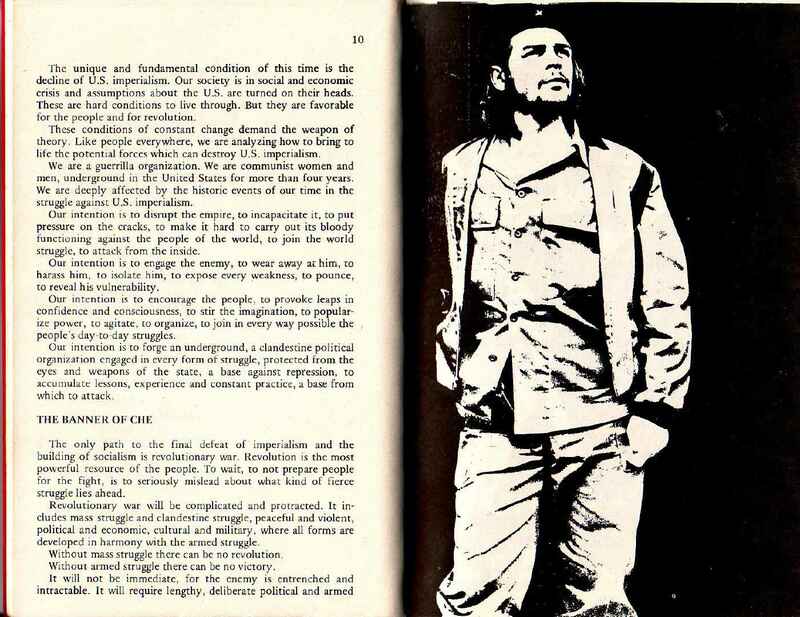 Page 11, as you can see, is a picture of Che Guevara. A full transciption of the text is below the image. The unique and fundamental condition of this time is the decline of U.S. imperialism. Our society is in social and economic crisis and assumptions about the U.S. are turned on their heads. These are hard conditions to live through. But they are favorable for the people and for revolution. These conditions of constant change demand the weapon of theory. Like people everywhere, we are analyzing how to bring to life the potential forces which can destroy U.S. imperialism. Our intention is to engage the enemy, to wear away at him, to harass him, to isolate him, to expose every weakness, to pounce, to reveal his vulnerability. 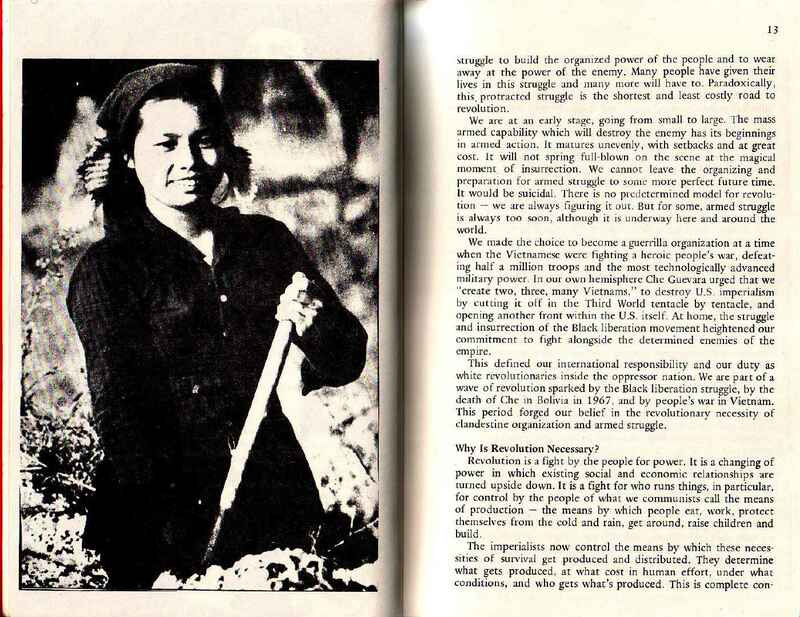 Our intention is to encourage the people, to provoke leaps in confidence and consciousness, to stir the imagination, to popularize power, to agitate, to organize, to join in every way possible the people's day-to-day struggles. The only path to the final defeat of imperialism and the building of socialism is revolutionary war. Revolution is the most powerful resource of the people. To wait, to not prepare people for the fight, is to seriously mislead about what kind of fierce struggle lies ahead. The following four scanned images are all short quotes taken from Prairie Fire's typewritten introduction. Below each quote is a transcription of the text. The final image of this section shows all these quotes in context in the full introduction to the book. 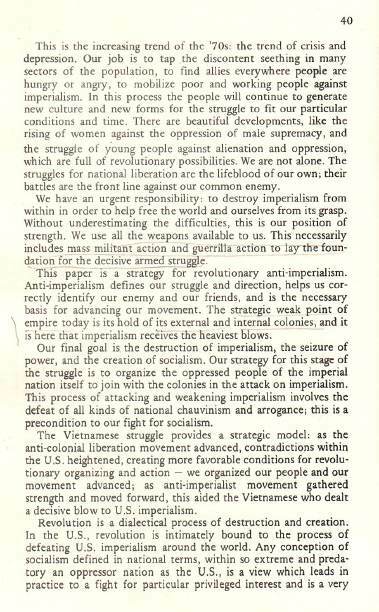 Here is PRAIRIE FIRE, our political ideology - a strategy for anti-imperialism and revolution inside the imperial US. We undertook this analysis to explain the changes in US and world conditions since the Vietnam ceasefire and to evaluate the consequences of the Vietnamese victory. We need a revolutionary communist party in order to lead the struggle, give coherence and direction to the fight, seize power and build the new society. 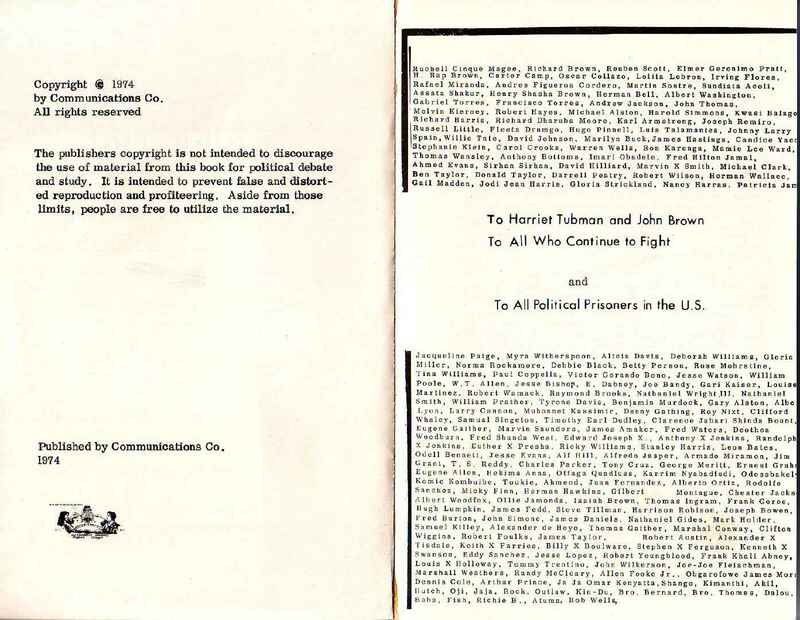 The following scan shows the full two-page spread of the introduction, outlining the Weather Undergound's revolutionary communism, their goal of overthrowing the capitalist system, and ending with the names of the authors -- including "Billy" Ayers. Remember: Click on the image if you want to see a high-resolution version. 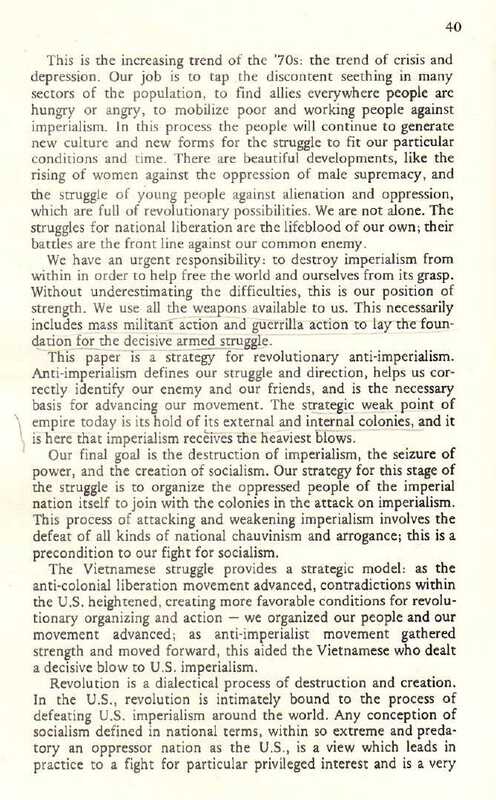 Here is PRAIRIE FIRE, our political ideology - a strategy for anti-imperialism and revolution inside the imperial US. It comes out of our own practice of the last five years and reflects a diversity of experiences. This paper is not the product of one or two people, nor even a small handful of us. Rather PRAIRIE FIRE represents the politics and collective efforts of an organization. It has been the focus of our study groups and our political education. It has been chewed on and shaped in countless conversations, struggles and written pages. It has travelled around the country, growing, developing thru the attempt to understand the shape of world forces and the revolutionary possibilities before us. 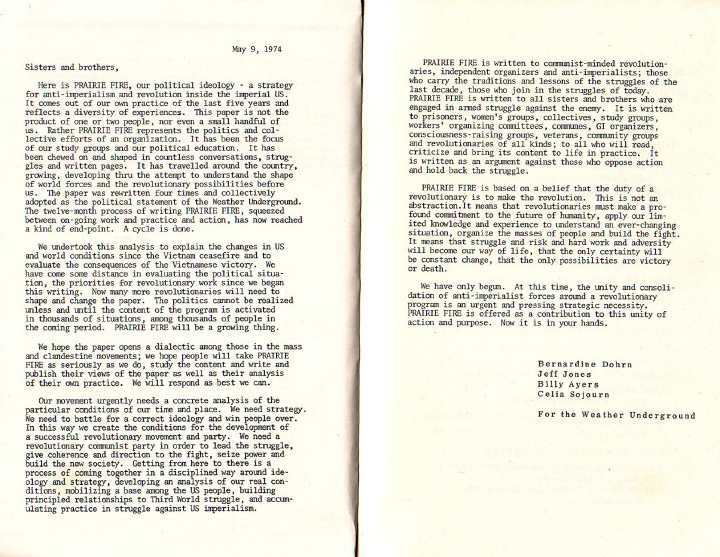 The paper was rewritten four times and collectively adopted as the political statement of the Weather Underground. The twelve-month process of writing PRAIRIE FIRE, squeezed between on-going work and practice and action, has now reached a kind of end-point. A cycle is done. PRAIRIE FIRE is written to communist-minded revolutionaries, independent organizers and anti-imperialists; those who carry the traditions and lessons of the struggles of the last decade, those who join in the struggles of today. PRAIRIE FIRE is written to all sisters and brothers who are engaged in armed struggle against the enemy. It is written to prisoners, women's groups, collectives, study groups, workers' organizing committees, communes, GI organizers, consciousness-raising groups, veterans, community groups and revolutionaries of all kinds; to all who will read, criticize and bring its content to life in practice. It is written as an argument against those who oppose action and hold back the struggle. As an aside: Note how, on the copyright page, the authors state that the public is "free to utilize the material" in the book "for political debate and study." That is exactly how it is being used in this essay, though I think it's not quite the kind of debate that William Ayers originally had in mind! Also note that my reproduction of their material, as per their instructions, is true and accurate, and that I am not "profiteering" from it because this site has no ads and does not generate any income whatsoever. Our job is to tap the discontent seething in many sectors of the population, to find allies everywhere people are hungry or angry, to mobilize poor and working people against imperialism. We have an urgent responsibility: to destroy imperialism from within in order to help free the world and ourselves from its grasp. Ever since the word "socialism" was brought up in the campaign by "Joe the Plumber," to whom Obama said he intends to "spread the wealth around," there has been much discussion among pundits about what the word "socialism" really means, and whether or not it's a bad thing. We made the choice to become a guerrilla organization at a time when the Vietnamese were fighting a heroic people's war, defeating half a million troops and the most technologically advanced military power. In our own hemisphere Che Guevara urged that we "create two, three, many Vietnams," to destroy U.S. imperialism by cutting it off in the Third World tentacle by tentacle, and opening another front within the U.S. itself. 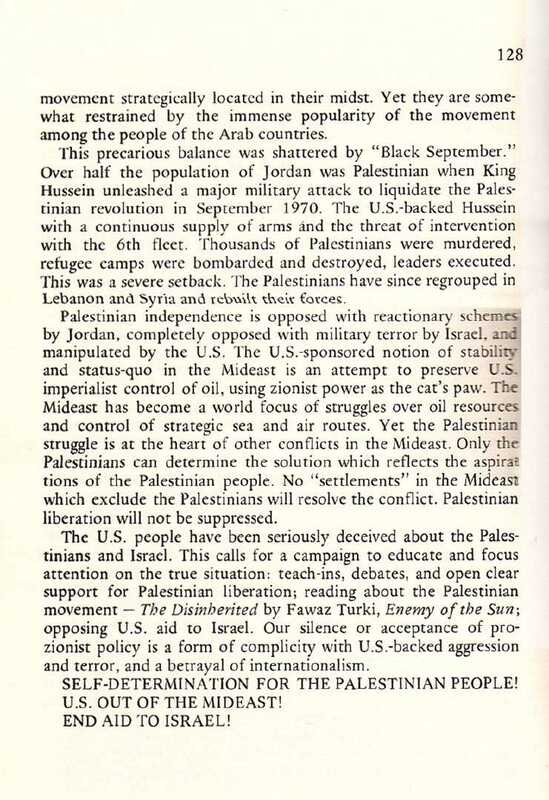 At home, the struggle and insurrection of the Black liberation movement heightened our commitment to fight alongside the determined enemies of the empire. 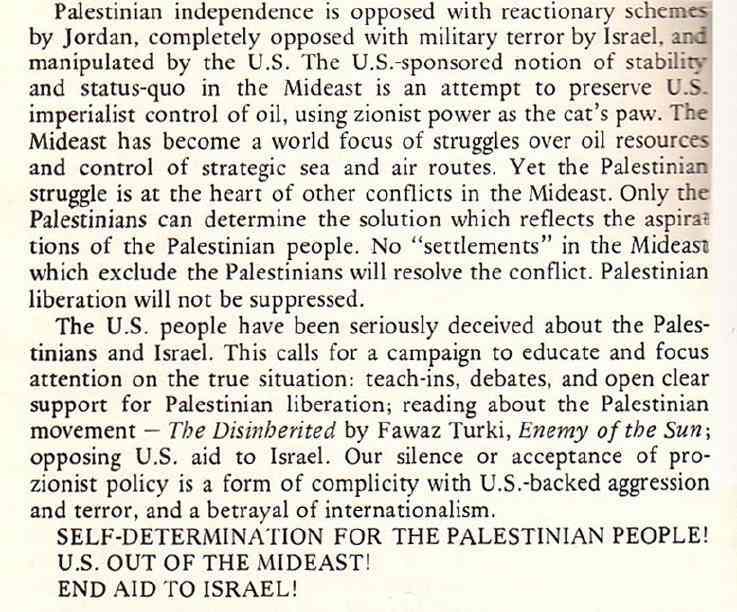 This defined our international responsibility and our duty as white revolutionaries inside the oppressor nation. We are part of a wave of revolution sparked by the Black liberation struggle, by the death of Che in Bolivia in 1967, and by people's war in Vietnam. At the beginning of this essay, I wrote that William Ayers is a communist. And while I certainly have shown that he was a communist, has he changed his stripes since 1974? Has he ever renounced the ideologies he embraced in Prairie Fire (and elsewhere)? In short: No. He still maintains the same belief systems. To this day, he sticks to the exact same phraseologies to describe his unchanged political philosophy. 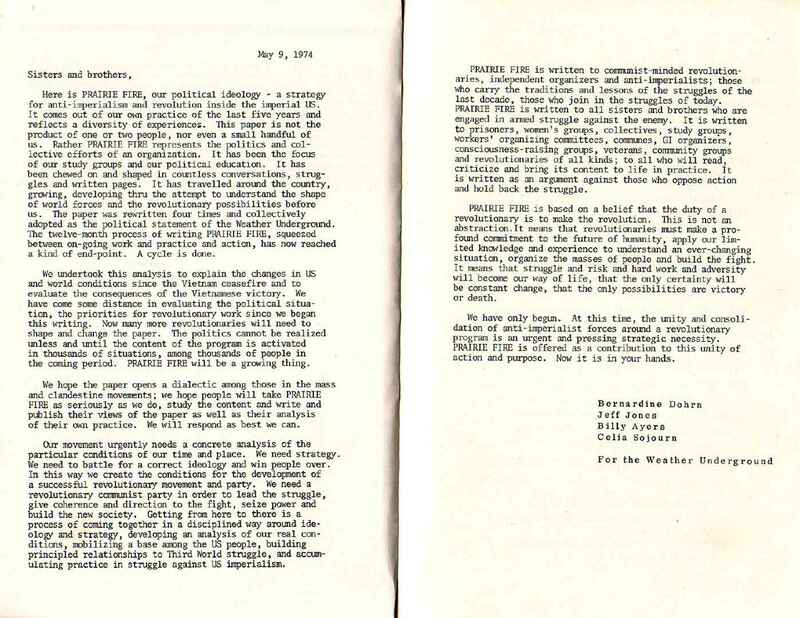 This section explores William Ayers' current beliefs about communist ideology. And why is this relevant? Because if he believed it in 1974, and still believes it in 2008, then he almost certainly continued to believe it in 1995-2006, the period during which Barack Obama had his associations with Ayers. There is no evidence whatsoever that Ayers went through some "right-wing phase" (which would have been totally out of character) nor had any diminuation of his political fervor. As far as anyone can tell, and according to Ayers himself, he has had a consistent and unchanged philosphy from the 1960s up until the present. What this means is that William Ayers was a communist when Barack Obama associated with him. So, let's get to the evidence about whether or not Ayers has changed his views. I considered myself partly an anarchist then and consider myself partly an anarchist now. I mean I'm as much an anarchist as I am a Marxist.... I'm very open about what I think and nobody here is surprised by what I think. Is one of those regrets that I took extreme measures against the United States at a time of tremendous crisis? No it is not. I don't regret that. The people of the world are being exploited and oppressed and militarized by the great imperialist powers, led by the United States. That is the situation today in my view. And I'm not sorry about anything that I participated to try to end that war or against that government that was waging that war. As the video notes, Obama was working directly with Ayers within days of this interview being given -- and for years prior and afterward. White supremacy and racism continues to be the dagger point of American democracy. I do believe that. I believed it then, I believe it now. In Prairie Fire, one can find many references to the United States government promoting violence, to white supremacy, and to racism. It's quite obvious nothing has changed in Ayers' philosophy. Next, let's turn to Bill Ayers' own personal blog, where he posts his own writings. We were anti-authoritarian, anti-orthodoxy, communist street fighters. On November 7, 2006 Ayers posted this essay on his blog describing his visit to a conference in Hugo Chavez's Venezuela -- an essay which sounds like it could be a missing chapter from Prairie Fire, and which Ayers concludes by shouting "Viva Presidente Chavez!" And just a few months ago on June 28, 2008, Ayers describes himself in this posting on his blog as a "socialist" when it comes to economic policy. All of this is, of course, just the tip of the iceberg. 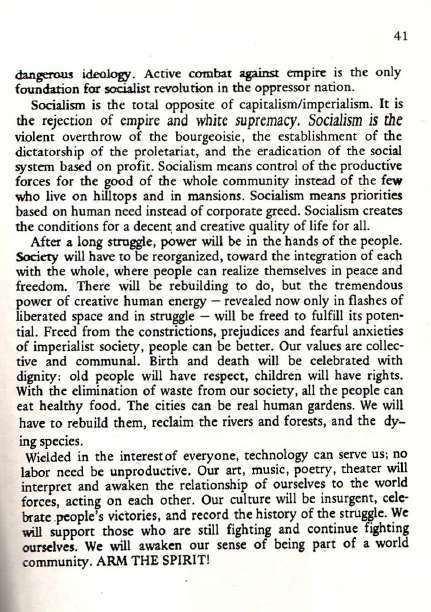 To this day, nearly every word that Ayers utters and every sentence that he writes hews to the exact same communist line. You can easily find hundreds more examples yourself just by browsing through his blog or simply by Googling his name and searching for his writings and speeches, almost all of which still revolve around notions promulgated in Prairie Fire. William Ayers is a communist. By his own description. He was a communist then, he is a communist now, and he was a communist for the entire time that Barack Obama worked with him and was associated with him. In 2001, the New York Times reviewed Ayers' fictionalized "memoir" Fugitive Days and called it "maddeningly evasive... one of those books that tell by not telling." Excellent article by David Horowitz about Ayers; the source of the quote in which Ayers describes himself as "Guilty as hell. Free as a bird. America is a great country." Undercover agent Larry Grathwohl, who had infiltrated and joined the Weather Underground, described their post-revolution governing plans for the United States in this video taken from the 1982 documentary "No Place to Hide." The Weather Underground openly discussed exterminating 25 million Americans who refused to be "re-educated" into communism. If you'd like to comment on this essay, you can do so here.